AERESS, the Spanish association of social and solidarity enterprises active in re-use, repair and recycling is calling on its government to introduce VAT exemptions for second-hand products. Used goods that have been recovered from the waste stream through ‘preparing for re-use’ and put back on the second-hand market by social enterprises should be a subject to zero percent VAT rate. A new study issued by AERESS shows that the monetary loss of the VAT contributions would be negligible compared to the positive impact on job creation and waste reduction. The association examined the economic, social and environmental consequences of different VAT rates (21 %, 15 %, 10 %, 4 % and 0 %) on the sale of second-hand textiles, bulky items and electricals which have been prepared for re-use by social enterprises working with groups at risk of social exclusion. It was assumed that current national targets for preparing for re-use would be achieved by 2020. The investigation found that VAT contributions from the sale of second-hand products only represent 0.02 % of the total collected. In case of zero VAT the state tax agency would stop receiving around 14.8 million EUR per year. However, with the help of the VAT exemption, the expected social impact on job creation and work integration was found to be positive, with AERESS estimating that the re-use sector in Spain could help support approximately 30,000 jobs by 2020. The campaign #UnImpulsoRedondo – ‘a circular impulse’ – is running in the context of Spain implementing its national waste management plan, including separate preparing for re-use targets, as well as the European Commission partially revising the VAT Directive. 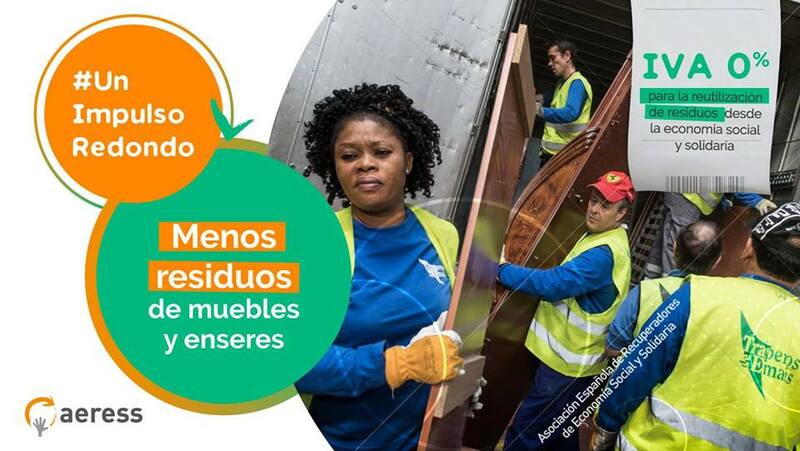 The AERESS network represents the best example of the a new circular economy model managing more than 90 000 tonnes of waste and employing almost 2 000 people. Around 48 % of the employment opportunities generated benefit groups at risk of exclusion, such as refugees, long-term unemployed, homeless people, ethnic minorities or people in rehabilitation processes.